SAN FRANCISCO, Dec. 27, 2016 – In 2016, researchers at the California Academy of Sciences added 133 new plant and animal species to our family tree, enriching our understanding of Earth’s complex web of life and strengthening our ability to make informed conservation decisions. The new species include one bee fly, 43 ants, 36 beetles, one sand wasp, four spiders, six plants, 23 fishes, one eel, one shark, seven nudibranchs, five fossil urchins (and one fossil sand dollar), one coral, one skate, one African lizard, and an alarming new bird virus. More than a dozen Academy scientists–along with several dozen international collaborators–described the discoveries. Proving that our planet contains unexplored places with never-before-recorded plants and animals (with their own set of evolving viruses), the scientists made their finds over five continents and three oceans, ventured into vast deserts, plunged beneath the sea, and scoured thick rainforests and towering mountain ranges. Their results help advance the Academy’s mission to explore, explain, and sustain life on Earth. 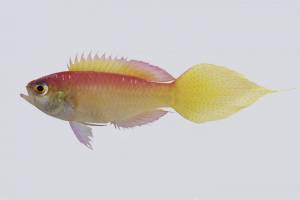 One pink-and-yellow fish has earned its spot in deep reef history. Grammatonotus brianne–an eye-popping species of groppo–is the deepest new fish discovery ever made by human hands. The discovery was captured on film at 487 feet beneath the ocean’s surface. Academy scientists are currently diving to twilight zone reefs around the world. In these narrow bands of deep reefs, animals live in partial darkness, well beyond recreational diving limits yet above the deep trenches patrolled by submarines and ROVs. Reaching extreme depths requires Academy divers and their collaborators to push the boundaries of both technology and the human body, using closed-circuit “rebreathers” that extend the amount of time they can spend underwater. The new groppo is one of several new species discoveries made during an Academy expedition (along with research partners from Hawaii’s Bishop Museum) to the Philippines in 2014–part of an ongoing, multi-year exploration of the Coral Triangle’s biological treasures from the shallows to deep mesophotic “twilight zone” reefs 200 to 500 feet beneath the ocean surface. G. brianne joins 24 new species of fishes–from camouflaging gobies to lanternsharks of the Indian Ocean–described by Academy scientists in 2016 alone. Dr. Brian Fisher, Academy curator of entomology and real-life “Ant Man,” recently added a whopping 43 new species to the tree of life. Fisher is a fierce advocate for the importance of small animals that support all terrestrial communities, and has devoted his life to the study of ants and biodiversity. Since 1996, he has conducted fieldwork in Madagascar–where only 10% of natural habitat remains–to explore regional biodiversity and generate data to drive conservation priorities in the country. Several of this year’s finds belong to a group called Stigmatomma–“Dracula ants” that build tiny, few-chambered colonies (generally no larger than a dime) beneath the soil. In a bizarre but fascinating means of distributing nutrients throughout the colony, ants from this group are known to wound their colonies’ babies before drinking their blood–a substance called “hemolymph” in insects. An elongated jaw with two large pincers also allows the ants to grasp prey mostly comprised of centipedes, but also beetle larvae. “Because these ants are so rarely collected, finding them is like uncovering buried treasure,” says Flavia Esteves, a postdoctoral researcher at the Academy who has joined Fisher in the field since 2010. Most Stigmatomma species spend the entirety of their lives beneath the soil or inside rotten logs. Esteves cuts through Madagascar’s clay-like soil with a machete, and then uses a pocket knife–and finally, forceps–to carefully expose the ants. All around us, insects flit, hover, and buzz about, but one family–the bee flies (Bombyliidae sp. )–may cause passersby to look twice. The nearly 5,000 species that make up this fly group imitate a wide range of relatives, from delicate honey bees to menacing wasps and spiders. “Don’t be deceived by stripes or fuzzy adornments,” says fly-expert Dr. Michelle Trautwein, Academy curator of entomology: insects from this group are all flies. A new species from Madagascar was recently discovered as part of a collaborative project between the Academy and the Schlinger Foundation to document the country’s diversity of insects and their close relatives. “He was longer and more slender than other bee flies, with big spikes on his thorax and longer, gray bristly hairs,” says Trautwein, describing why Natalia granted it its grandparent moniker. What’s more, this stubbled bee fly was completely isolated from any other species within the same relative group. Similar species of bee fly are found in Northern Africa and North America–both a long way from Madagascar–meaning this “thorny grandfather” is part of a group with an incredibly wide distribution. No matter where they’re found, adult bee flies spend their time pollinating nearby plants. But as larvae, they prey viciously upon the larvae of other species. Adult bee flies will deposit their larvae in an aerial raid: dropping them from above to land in strategic locations where they can hatch, invade a nearby nest, and consume larvae of other insect colonies before growing up to be gentler, flower-visiting–rather than larvae-poaching–adults. This year, scientists uncovered a fascinating new clue in the global mystery surrounding wild birds with grossly deformed beaks. Dr. Jack Dumbacher, Academy curator of ornithology and mammalogy–alongside a team of researchers from UCSF and USGS–identified a new virus that has been linked to Avian Keratin Disorder (AKD), a disease responsible for debilitating beak overgrowth and whose cause has remained elusive despite more than a decade of research. This new virus–identified from Alaska and the Pacific Northwest–is being investigated as a potential cause of AKD and represents a critical step in understanding the emergence of this disease in wild bird populations around the world. After sifting through hundreds of thousands of DNA fragments (and comparing them to known virus groups among birds), scientists identified a new virus suspect belonging to the picornavirus family–a large and diverse group that includes well-known human offenders like polio, hepatitis A, and the common cold. The team named their discovery Poecivirus after the genus of black-capped chickadee (Poecile atricapillus) from which the sequences originated, and in which AKD was first documented. Though more research is necessary to establish Poecivirus definitively as the main cause of AKD, it remains the strongest lead yet. As part of the new virus description, the team generated a detailed map of Poecivirus’ genetic material–a tool that will enable scientists all over the world to aid in its identification among birds exhibiting clinical signs of AKD. After more than a dozen combined expeditions to the damp rainforests of Madagascar and cloud-kissed mountains of southwestern China, Dr. Dave Kavanaugh–Academy emeritus curator of entomology–is sharing 36 exciting new discoveries. Ground beetles are a wildly diverse group of winged and wingless predators that feast on other insects, and some are known to survive in extreme environments around the world. Twenty-six of Kavanaugh’s recent species discoveries hail from Madagascar’s Ranomafana National Park–an area of lush tropical rainforest stretching nearly 160 square miles across the southwestern portion of the island. During one 5-week expedition, Kavanaugh’s daughter Kathryn (for whom he later named a beetle Chlaenius kathrynae) assisted him in the field by searching for species of ground beetles in the leaf litter. Several additional new species (including three new genera) are described from the Gaoligong Mountains of China’s Yunnan Province, a region where extreme physical geography has caused a jaw-dropping array of species to evolve over millennia. Since 1998, Kavanaugh and his colleagues have trekked mountains packed with endemic species–those found nowhere else in the world. Scientists view the region as an isolated paleoenvironment, or an area that (due to its location) has remained relatively unchanged for millions of years. In less than two decades, the team has grown the list of the area’s known ground beetles from 50 to 550 species. Amid outcroppings of granite in the arid, sloping lowlands of southern Angola, a newly discovered species of lizard wedges itself into particularly tight crevices, head-first. Only threatening spines are left exposed along its body and tail to deter approaching predators. Despite this clever maneuver, there was no escaping discovery by Dr. Edward Stanley, Academy herpetology research associate, who suspected this particular lizard might differ from known species in the area. Just north of San Francisco off California’s coastline, countless species thrive in the deep, chilly waters that make up the Greater Farallones National Marine Sanctuary–one of the most biologically productive regions on the planet. Here, scientists use remotely operated vehicles, or ROVs, to explore life beneath the surface. On a 2012 expedition with NOAA, octocoral expert and Academy curator of invertebrate zoology Gary Williams set off aboard the R/V Fulmar to investigate vibrant offshore life down to 1,400 feet deep. Among the sea stars, sea worms, snails, sponges, and crabs, Williams saw a single, whip-like stalk–only 15 inches in length–of a snow-white coral gently swaying in the ocean currents. Unlike the hard coral relatives that compose the famous tropical reefs closer to the ocean’s surface, this soft-bodied coral species stands alone at depth and feeds on microscopic plankton floating through the water column. Even before its formal description, the new species–now named Swiftia farallonesica after its sanctuary home–served as a brilliant symbol of the region’s ecological importance, and helped strengthen the case for sanctuary expansion. In March 2015, NOAA ensured these sanctuaries would be protected for years to come by more than doubling their size and adding strict bans on all drilling, mining, and ship discharges. The expansion added 2,700 square miles of protected territory, reaching up to Point Arena in Mendocino County. Other new invertebrate species highlights include: five fossil species of ancient urchins and one fossil sand dollar described by invertebrate zoology curator Dr. Rich Mooi, and seven colorful new nudibranchs (sea slugs) described from the world’s shallow reefs–including one from California–by longtime invertebrate zoology curator Dr. Terry Gosliner.